ACU-DOCTOR is a new user-friendly hand-held device with digital display for location of acupuncture or trigger points. It incorporates an effective push button stimulation feature for immediate electroacupuncture treatment of the point or area immediately following its detection. The digital display helps the user to locate the most accurate acupuncture or trigger point easily, as the number increases with the lowering of the electric resistance of the skin (when a maximum number is reached, an acupuncture point is detected and electroacupuressure may begin). Self-treatment for electroacupuncture has never been so easy! This new model has additional features, such as adjustable frequency from 1 - 16 Hz, and polarity reversal switch (for tonification or sedation). It is one of the most innovative hand-held stimulators available in the market. Stimulator/Detector is limited to cleaning the stimulator battery contacts and metal electrodes. The stimulator operates on a 9 volt battery (A 9 volt Duracell or other alkaline battery is recommended). When adequate stimulation can no longer be maintained, change the battery. Remove the old battery and replace it with a new battery. On the body surface, the electric resistance of a trigger point or a reactive point is lower than in its surrounding areas. It can be readily located by means of an instrument which is sensitive to resistance changes. When the metal probe touches a low resistance point the loudspeaker gives a sound signal. Its pitch rises with the lowering of the electric resistance of the skin. With this device and method of detection, trigger points thus located usually produce a strong sensation and reaction to electric stimulation, and will achieve the best therapeutic results. 1. The Digital Display chamber is located on the rear to side of the unit. The device features a digital display to show the working frequency (from 1 to 16 Hz) of stimulation during acupuncture treatment when pushing down the stimulation button, and a numerical display (maximum around 500 when sensitivity is adjust to the highest range) to show the sensitivity of detection during the location of acupuncture points. When used in Acupuncture or trigger point detection, the digital display will show the location of the acupuncture point in numerical form. During acupuncture location, the highest numerical value refers to the nearest site of acupuncture point. The green indication LED will remain lit when the acupuncture point is located. The Polarity switch easily allows the output stimulation's polarity to be reversed from + (for tonification) to – (sedation) or vice-versa during acupuncture treatment. In doing this, the output intensity should be turned down first in order to avoid a sudden increase in intensity. Acupuncture treatment through the probe may be used for the immediate treatment of the point or area right after its detection to the patient, by simply pushing down the stimulation/detection button on top of the unit. Immediate Point Location and Treatment: the button on the top of the unit may be pressed to activate the stimulation mode. A continuous electric pulse of 1 to 16 Hz (adjustable by turning the frequency dial) is emitted through the probe, the intensity may also be adjusted from 0 to 22mA. The intensity is controlled with the intensity knob labeled “INT”. Micro current intensity is emitted when the switch is in the “blue” zone. When treating with micro current intensity, there will be very little or no feeling of stimulation achieved even the probe is located at the trigger or acupuncture points. This new improved interchangeable spring type probe provides a more constant and comfortable acupressure to the area or points, thus providing better accuracy during point location searching. It is important to note that any part of the body may be induced to produce a point location signal depending on the amount of pressure used during location. Thus, it is important when locating the trigger points to use the least amount of pressure possible on the surface of the skin. Also, the movement of the probe when searching for the point should be smooth and graceful, always maintaining the same light uniform constant pressure until the correct point is found. The unique spring mechanism of the Pointer probe will add in correction for any slight variations in the applied pressure. Two different probes (2mm & 4 mm diameter) are provided for different applications. The smaller probe is more suitable for ear points, and the wider probe is better for the body. The point detection sensitivity is adjustable. The “SEN” knob is used to either increase (clockwise adjustment) or decrease (counter clockwise) sensitivity when used on different skin conditions (i.e. dry or moist skin). The level of sensitivity can be read from the Digital Display Chamber. The patient must hold the hand grounding pole in order to create a complete electrical circuit. This accessory is easily attached or removed from the unit. (Note: this unit may also be used without the grounding pole, however, in this case the practitioner must contact both the grounding plate(e) on the unit as well as hold the bare skin of the patient with his hand to complete the circuit.) The grounding pole is not necessary when using on oneself providing the grounding plate(s) on the unit is contacted. Frequency adjustment dial, to adjust the frequency of stimulation from 1 to 16 Hz. The frequency selected can be read from the display chamber when pressing down the push type button on the front top of the unit. 9. Two ground plates, one located at the front left hand side, and the other one underneath the unit, to allow the user (or left handed user) to hold the unit and touch the ground plate(s) easily in closing the circuit for point detection or stimulation. 1. Insert the 9 volt battery onto the battery clips, the positive and negative poles of the battery should always be matched correctly with the respective battery clips. A 9 volt Duracell or other alkaline battery is recommended for the best performance. 2. Two different probes are provided for different applications. The larger probe may be used for larger areas or body points while the small probe may be used for ear points or other smaller body points. 3. For self-use, touch the grounding metal plate(s) on the front side or underneath the unit and then search for the point. 4. Press each point slightly; the probe uses a spring mechanism so that a constant pressure may be maintained during location. The trigger point is located when a continuous sound is heard from the buzzer and at the same time the LED light located in front of the Loc/Stim button is flashing continuously. 5. If stimulation is required on this point, simply adjust the intensity knob “INT” to an acceptable level and press the loc/Stim button. When this button is released, the unit is immediately returned to the point detection mode. Pressing the Loc/Stim button again will produce output stimulation. The intensity is controlled with the intensity knob labeled “INT”. Turn the switch clockwise to increase the output intensity. Micro current intensity is emitted when the switch is in the “blue” zone. When treating with micro current intensity, there will be very little or no feeling of stimulation achieved, even if the probe is located at the trigger or acupuncture points. 6. It is recommended to begin treatment with a low intensity setting, thereafter turning the “INT” control until a comfortable intensity is reached. 7. In order to treat patients, the grounding pole must be attached with the plug jack to the bottom of the unit. The patient must hold the grounding pole to complete the electrical circuit which then activates the detection and stimulation functions. 8. This device is equipped with a Polarity switch. If a positive (+ for tonification) or negative (- for sedation) pulse stimulation is required, simply set the switch to + or – position. 9. The Digital Display chamber is located on the rear top side of the unit, it features a digital display to show the frequency (from 1 to 16Hz) of stimulation during operation, and numerical display (maximum around 500 when sensitivity adjustment to highest range) to show the sensitivity of detection during the location of acupuncture points. 10. Turn off the unit after use. Remove the battery from the unit when the device will not be used for a long period of time. The length of treatment or stimulation time depends on the point or area to be treated as well as other factors. Generally, treatment times may vary from 3,5,10, or 20 seconds, longer times may also be necessary in some cases. The best treatment times and intensities should be selected based on the practitioners experience and training. Your Pointer Plus Stimulator requires 1 9V battery, use PP3, 6F22 or its equivalent type of battery (Alkaline battery is recommended). The battery is replaced by opening the battery door on the bottom side of the Unit. Slide the battery door off, remove the old battery and insert the new battery. Insert the battery correctly with the polarity according to the diagram shown in the battery compartment label. Make sure the directions of positive and negative poles of battery inserted is correct and be sure you are using a fresh battery. Close the battery door. Battery life is 4 to 20 treatment hours depending on how high the current is set and how long each treatment session is. Many short treatment sessions give longer battery life than fewer longer sessions. To avoid battery leakage, remove the battery if the unit will not be used for an extended period of time. 1. One sensitivity control knob on the right hand side of the unit to control the sensitivity (by touching the stimulation probe with the ground pole) can be read from the Digital Chamber Display. The higher the value, the higher the sensitivity. During location of trigger or acupuncture points, the number varies and reach maximum when the exact point is located. 2. An intensity and ON/OFF control knob on the left hand side of the unit to control the intensity of the output through the metal probe electrode, which is located at the front tip of the unit. 3. A push type button on the front top of the unit. Press this button to activate the stimulation mode. A continuous electric pulse of 1 to 16 Hz (adjustable) is emitted through the metal probe. 4. 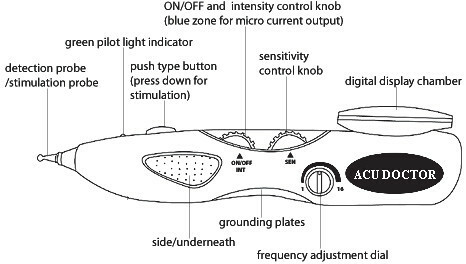 Frequency adjustment dial, located under the sensitivity control knob, to adjust the frequency of stimulation from 1 Hz to 16 Hz. The frequency selected can be read from the display chamber when pressing down the push type button on the front top of the unit. 5 Polarity change over switch, located at the front side of the unit, to change the polarity of stimulation from + to – or vise versa. 6. The digital Display chamber is located on the rear top side of the unit. It features a digital display to show the frequency (from 1 to 16Hz) of stimulation during operation, and numerical display (maximum around 500 when sensitivity adjustment to highest range) to show the sensitivity of detection during the location of acupuncture points. 7. There is a green pilot lamp on top of the unit, next to the push type button. This will light up when the point location or stimulation mode is in action. 8. Two ground plates, one located at the front left hand side, and the other one underneath the unit, allow the user to hold the unit and touch the ground plate(s) easily in closing the circuit for point detection or stimulation. 9. There is one jack on the bottom side of the unit. This is for connecting the hand grounding pole.